With vines growing between 1,000 and 3,000 meters above sea level, Salta, Catamarca, and Tucumán make up the famous Calchaquí Valleys. A great varietal character and incredible concentration are the features that make their wines be distinguished worldwide. The wines from the northern region of Argentina present great attributes that have been recognized by experts, journalists, and tasters from all over the word. Salta, Catamarca, and Tucumán, make up the Calchaquí Valley. From this region, excellent wines are born, which are characterized by their vast array of aromas, colors, flavors, and where the terroir denotes its strength, expressing in its wines the typicity of the region. In these provinces, apart from Malbec, Torrontés and Tannat are two varieties that show a great drive, giving pleasant wines to the palate, which are worldwide appreciated. 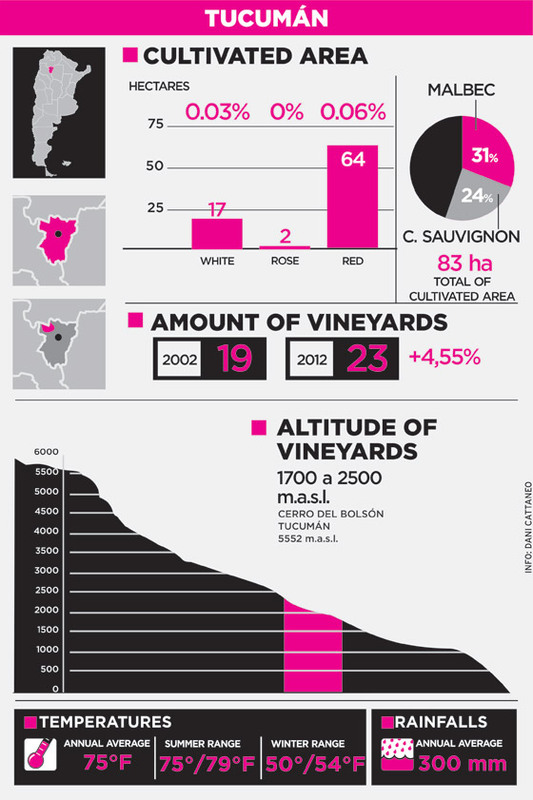 For that reason, the strategy developed by Wines of Argentina is to continue the positioning in this region, which has found its space in the domestic and foreign market, offering a wide range of unique wines that are unlikely to find in other wine regions of the country. This region is known as one of the most picturesque scenery in Argentina. 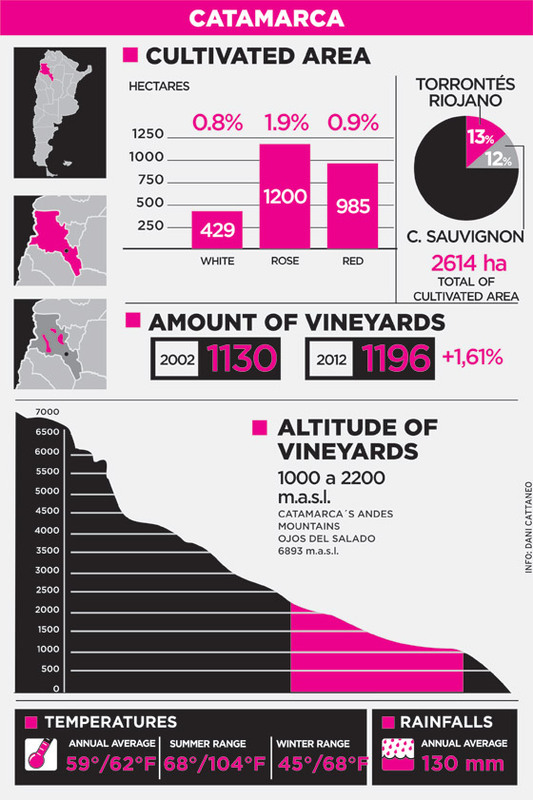 Within its wine context, Cafayate locality stands out, accounting for 70% of the Valley’s vineyards, with 3,200 cultivated hectares, of which 99% are intended for fine wine-making. One of the representative wineries is Etchart. Ignacio López, the firm’s winemaker, told that the province offers a great diversity of conditions, with different soils and special features. However, he pointed out that some of the characteristics that define Salta are its high-altitude vineyards; poor, sandy, and deep soils; really high sun exposure; low humidity; and a wide temperature range between day and night. In addition, Mounier highlighted that thanks to these characteristics, the concept of terroir is highly appreciated in the Northern region of Argentina. Then, Mounier added, “Particularly, the wide temperature range makes plants not to be stressed out during the night, enabling them to remain synthesizing the color, aromas, and flavors. For that reason, wines generally display great color, aromas, and flavors, with intense and ripe tannins.” Afterwards, the professional said that both white and red wines are characterized by their fruit profile, as well as their varietal typicity. Moreover, López added that the vineyards in Salta, unlike in other parts of the country, exhibit an incredible personality, aromatic intensity, deep and vibrant colors, and striking volume on the palate. Additionally, Mounier highlighted that some time ago, Cafayate or Salta used to be associated only with Torrontés, the emblematic white wine of these Valleys. Nonetheless, he explained that other varieties are developed with great expressiveness. 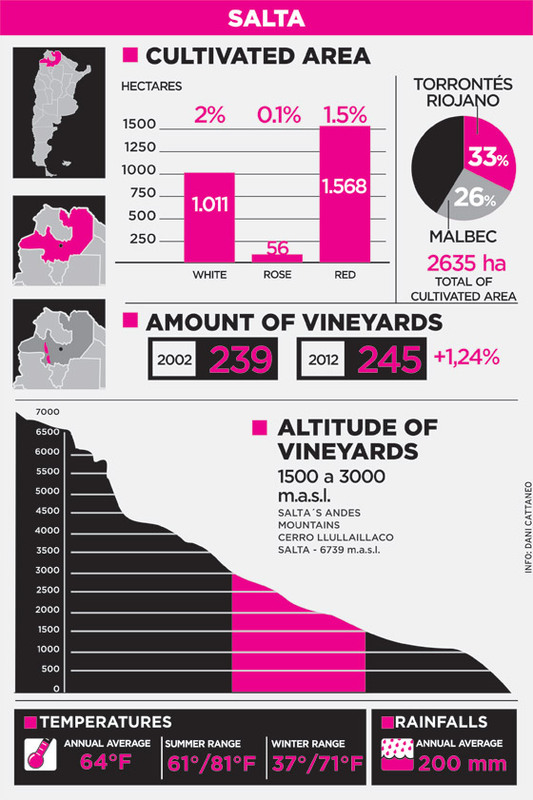 Among them, “in the case of whites, Chardonnay, Sauvignon Blanc and Viognier, while among reds, we find Malbec, Cabernet Sauvignon, Tannat, and to a lesser extent, Merlot, Syrah, Bonarda, Barbera, and Pinot Noir”. The winemaking of this province has been gradually positioned in the domestic and foreign market, after a restructuring and research of the market. Alberto Guardia, director of ‘Las Arcas de Tolombón’, winery that has been working for a long time on the positioning of its wines, among them Siete Vacas, talked to Wines of Argentina about the unique characteristics of Tucumán vineyards. According to him, “most of grapes come from the central southern area of the Calchaquí Valley, along 50 km approximately, between Salta in the north and Catamarca in the south, so Tucumán shares 320 km long of the geographical Calchaquí Valley (between Abra del Acay and Punta de Balasto). As regards the terroir, it is a sub-Andean valley blessed by dry and arid climate. It is cold in winters and warm in summers. It has annual rainfalls of 120 mm, one of the driest areas throughout the valley. It has 345 sunny days a year, leading to a wide temperature range: 79° F, with annual average of 61°F (1.39°F / 99°F) and constant winds. The soil of this region is sandy and with rugged landscapes, due to the valley slopes and steep mountains. Besides, the director of Las Arcas de Tolombón said that one of the main attributes of the wines made in Tucumán is the concentration of color, aromas, and alcoholic content. Then, he added that as a result of the last workshop on Tucumán wines, some Argentinian winemakers, such as Susana Balbo, Roberto de la Mota, Edgardo Del Pópolo, Rodolfo Sadler, Marcelo Pelleriti, Alejandro Vigil, and José Luis Mounier, agreed that this province gives birth to “international-level wines, with great potentiality, especially the reds, displaying a lot of color, a great fruit character and aromatic intensity”. Among the varieties, the experts mentioned that in general, they tasted great examples. Among them, Torrontés stands out, followed by Malbec, Cabernet Sauvignon, as well as the blends, “even we were impressed by Tannat”. In relation to the latter grape, the professionals highlighted that wines from this variety have a potentiality that is not expressed in other places of Argentina. In respect to its positioning, Guardia explained that the region has grown considerably in both the domestic and foreign market, mainly due to the support, participation, and commitment of Wines of Argentina and the Institute of Productive Development of Tucumán. The wine region of Catamarca stretches in the oases of the western valleys of this province. The locality of Tinogasta concentrates 70% of the grape-growing area intended for wine- making and fresh consumption. Other producing localities, less developed, are Belén, Fiambalá and Santa María. Two of the typical varietal wines of Catamarca are Torrontés Riojano and Cabernet Sauvignon.